One of Barbara Kopple’s great gifts as a documentarian is that she can turn any subject into a story. Whether she’s doing celebrity portraiture (as in her 2006 Dixie Chicks tour film Shut Up & Sing or her recent Miss Sharon Jones!) or she’s on the front-lines of organized labor disputes (as in the Oscar-winning Harlan County, USA and American Dream), Kopple always looks for the strong narrative line, so she can explore bigger issues through the natural pull of everyday drama. Her filmography is so eclectic that it’s sometimes hard to put her work into any particular category or genre. She’s never been exclusively a “verité” director, or a political polemicist. She mostly just tries to connect two sets of human beings: the ones on her screen and the ones watching. 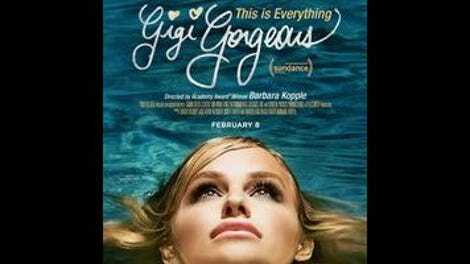 With This Is Everything: Gigi Gorgeous, Kopple had the challenge of documenting someone who has spent most of her life documenting herself. As a result, the boundary between how Gigi Gorgeous wants to define herself and the filmmaker’s own perspective on her is often too difficult to discern—which is a problem only inasmuch as this is a YouTube Red film about a YouTube star, and at times it seems more like a commercial for a personality than a piece of probing journalism. But it’s a fascinating doc regardless, because of how Kopple and her editors weave Gigi’s video archives into their own footage. Gigi Gorgeous was born Gregory Lazzarato in Canada, and was a champion diver as child, before abandoning sports to focus on a series of YouTube videos about applying makeup. Like a lot of the site’s early celebs, Gigi’s clips started out as goofy and instructional, and then became more confessional—especially when she began transitioning from male to female. Throughout the evolution, her number of followers grew, to the point where she’s been able to make a generous living from sponsorships and promotional appearances. Kopple’s smartest move with This Is Everything is to stay strictly chronological. First we meet Gregory, and then we meet Gigi. There’s no jumping around between the two, and no starting with a full-fledged internet celebrity and then going back to explain where she came from. This is a film about a person discovering who she is, often through a process of trial-and-error and sudden headlong leaps into something new—without knowing in advance that it was all going to work out okay. Following that journey as it happens (mostly through old home movies and YouTube videos) shows both how Gigi has changed and how her father David has adapted to having a daughter. What’s harder to determine is whether This Is Everything is meant strictly as a celebration of a profound transformation or as a complex character study. At times Gigi appears to be grossly self-centered, whether she’s treating her widowed father’s remarriage as a chance to show friends and family how she’s changed (as opposed to a chance to support her dad) or she’s getting deeply offended because David still sometimes forgets to use the right pronoun (while he’s sitting by her hospital bed helping her sip ginger ale through her bandages). A few times in this film, Kopple starts to position this story within a larger context of LGBTQ history and the complexity of sexual identity, but Gigi never seems especially interested in any of that. In this film at least, she’d rather talk about her looks and her popularity. While Kopple does a great job of setting up the story of Gigi’s life, This Is Everything sort of tails off at the end, with a scene from a fashion show and a tacked-on addendum about some troubles Ms. Gorgeous had in Dubai—neither of which effectively summarize all that’s come before. For the most part, though, this is a vivid picture of modern life, and an inspiring tale about how a more tolerant family—and society—can make it easier for people to be themselves rather than negating themselves. Whether of not she comes across as a deep thinker on gender, Gigi is undeniably courageous for the way she’s risked the ridicule and vitriol of online trolls in order to reach out to other young men and women who are trying to understand themselves. Kopple and her team have combed through the hours and hours of those dispatches that Gigi has sent into the world, and from them they’ve pieced together a story very much worth telling.